Yesterday my Facebook friends informed me that it was: (1) National Hummingbird Day; and (2) National Fight Procrastination Day. Good timing for the second, because without even knowing about NFPD I had finally gotten down to work on a project I’ve put off for months. But bad timing for me that it was National Hummingbird Day, because I had to put off writing this post honoring hummingbirds. So, please excuse that I’m a day late to show you some of my favorite original photos of my favorite birds. This is one of my most treasured photos. George noticed a hummingbird darting into the tree in front of our house, and patiently waited until she trusted him enough to return to her nest. With a long enough lens I didn’t have to get too close to her for this shot. Her two eggs hatched and the babies thrived and flew away. You can see a photo of them on the “Birds” section of my website. Another shot I’m really proud of. This hummingbird kept visiting the flax flowers in our friend Joan’s garden, until his beak was totally covered with pollen. Along with the flowers and bushes George plants in our garden for the hummers and other birds, we also have feeders so they can quickly get strength from the sugar-water to keep foraging. I can sit for hours watching them dart in and away from the feeders, and once in awhile they reward my patience by hovering there long enough for me to get a photograph. They also love the buddleia (butterfly bush) that George planted for the bees and butterflies. This little fellow kept returning to a branch near where I sit in the backyard. I crept closer until I got this shot of him with his feathers fluffed out. And here’s one as he zoooomed past me! I have many more photos of hummingbirds on my website. 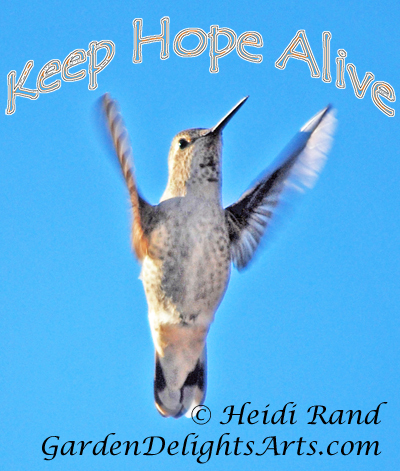 I also have a wide range of prints, cards and other products that I make from my hummingbird photos, which you can see on my Artfire and Etsy stores, or that are made and sold through my Zazzle gallery. Finally, when the stars align, and when the light and angle is just right, I catch the bright scarlet head of the male Anna’s hummingbird in all its glory! How did you celebrate National Hummingbird Day? Did you cross anything off your “to-do” list for National Fight Procrastination Day? What’s that flower, I asked George. It’s rare that I spot a treasure in the garden before he sees it, and he was delighted that the first flower on the Cantua buxifolia he planted last year bloomed. We had grabbed the Cantua the minute we saw it at Annie’s Annuals, figuring from the flower’s shape that hummingbirds would like it. Annie’s helpful i.d. card confirmed our hunch: “Adored by hummingbirds!” George didn’t remember the common name but thought it was something like Queen or Princess of the Incas. It’s the national flower of Peru, and he wasn’t far off – one of its common names is Sacred Flower of the Andes. He probably remembered reading about the Inca legend associated with the flower, you can see it here on wikipedia. A hummingbird was zipping around the garden. We hoped he’d feed from the Inca Princess flower but he decided to visit the Meyer lemon tree flower instead. I only had time to grab these two photos before he sped away. What’s blooming in your garden this week, and who’s feeding from it? This hummingbird zooms between our back garden and the deck feeders. I sit out back, hen on lap and reading a book, with my camera turned on. Hummingbirds dart around so quickly that you need every advantage you can take. I was so happy to grab this photo of him getting nectar from a flower on our lemon tree. The light was low, and although I loved his pose the photo was a bit grainy. Instead of getting rid of the noise, I used paint and other image tools to emphasize it. Did you take a special photo this week, or make a drawing or other piece of art? 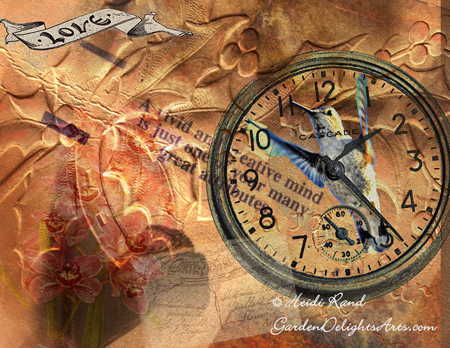 And this is my latest collage, with the same pocket watch photograph, for early birds like me. 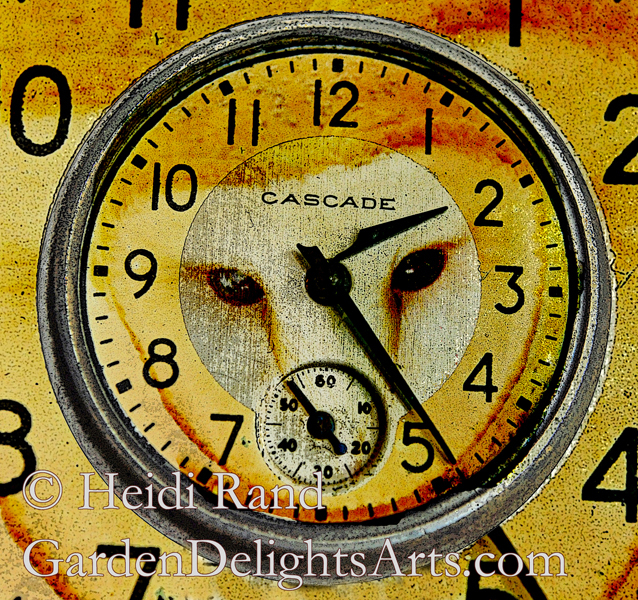 Whichever you are, don’t forget to spring ahead tonight! In honor of Martin Luther King Jr. and the inauguration of President Barack Obama.